Over the decades, when I had something to give away to charity, I would always just call Goodwill. They’d come with a big truck and haul my stuff away. In the decades before the Internet – and therefore Craigslist – when the kids grew out of their bicycles, that was the easiest way to get “rid of them” and contribute to a good cause. Checking just the Goodwill section alone, this had me think that by giving to Goodwill, I have made a terrible mistake for many years, all my life, really. Then I went to do some fact checking and found almost dozens of references to this chart being a scam, among them this site, which debunks the claims made by the above poster. Claim: CEO and owner Mark Curran profits $2.3 million a year. Goodwill is a very catchy name for his business. You donate to his business and then he sells the items for PROFIT. He pays nothing for his products and pays his workers minimum wage! Nice guy. $0.00 goes to help anyone! Stop giving to this man. Facts: This claim is completely false. According to the Goodwill website: “82 percent of Goodwill’s revenues go directly into employment and training programs for people with disabilities and other barriers to employment!” Jim Gibbons is the CEO of Goodwill Industries International and his most recent compensation was reported to be $729,310. Goodwill has refuted some of these claims here. 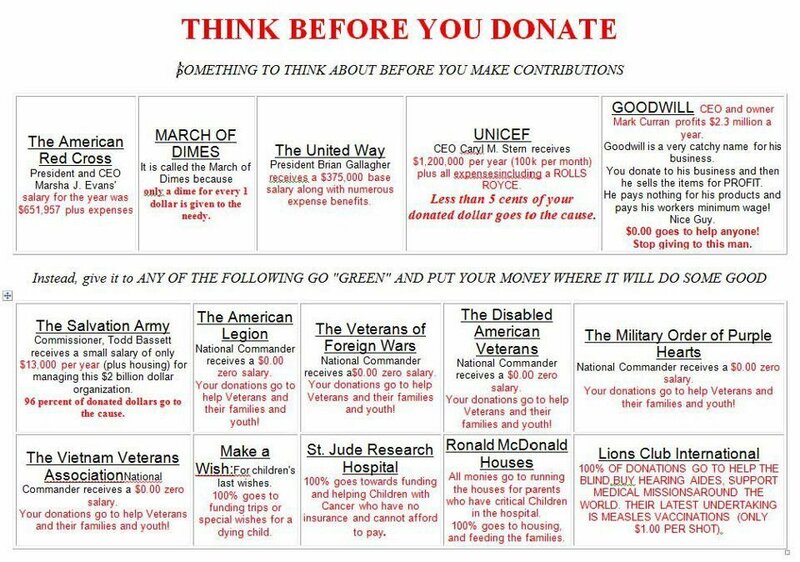 This made me feel better, and I have come to the conclusion that the only thing right about the chart above is that it is important to “Think Before You Donate.” Clearly, it’s paramount that we check out the organizations we donate money to, so we know what we are actually doing. Finally, watching the TED talk in the video below was one of the most valuable 18-minute investment of time I have made in a long time. Even though I work with the government sector and non-profits every day, my conceptions of non-profits and charities, and the results they achieve, were completely wrong. This speech by Dan Pallotta, a fundraiser and charity expert, will change the way you think and feel about non-profits, their role in out society and their impact. To get a higher resolution of this video, go to TED talks directly by clicking here.